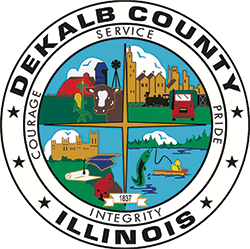 DeKalb County was formed on March 4, 1837, out of Kane County, Illinois. The County was named in honor of Johann de Kalb, a German (Bavarian) hero of the American Revolutionary War. DeKalb County is approximately 632.7 square miles, located 63 miles west of Chicago. There are 19 townships in the county with the county seat at Sycamore. Between 1834 and 1837, early white men began to settle in DeKalb County along the streams and wooded areas because of the fertile soil, wild game, and food and water opportunities. Major growth stemmed from the introduction of the railroad which brought easier methods of transportation and opportunities for industrial growth. Some of the notable industries based in DeKalb County were: Sandwich Manufacturing Company, Marsh Harvester Company, Barbed Wire, Gurler Brothers Pure Milk and many more. Landmark exhibits the site which held the first regular session of DeKalb County Court -1837. Erected in 1917 by D.A.R. (Daughters of the American Revolution) and DeKalb County. (The site is located 2/10 of a mile East of the intersection of North First Street and Coltonville Road) It is a beautiful site which is an impressive reminder of the early settlement of Coltonville and the birth of DeKalb County government. The county has always been noted for agriculture. In 1852, the first Agricultural Fair was held in Sycamore, under the supervision of the DeKalb Agricultural Society. Eventually farmers, businessmen, bankers and newspapermen organized to become the DeKalb County Soil Improvement Association. In later years the DeKalb County Soil Improvement Association would split into two and become DeKalb County Farm Bureau and DeKalb Agricultural Association (DEKALB AgResearch, Inc., Monsanto). DeKalb County is credited with being the birthplace of the Farm Bureau movement. Education has played an important role in the area with Northern Illinois University located in DeKalb and Kishwaukee Community College located in Malta. A major fair has been held each year since 1887 at the Sandwich Fairgrounds in Sandwich.